War is ultimately a human problem requiring a human solution. 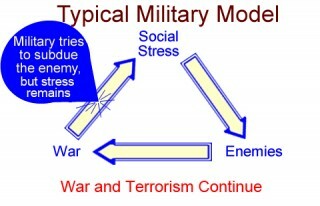 Experts in the field of conflict resolution maintain that the underlying cause of war is accumulated "social stress" - i.e., mounting political, religious and/or ethnic tensions between rival factions in critical hotspots throughout the world. As social stress builds, divisions grow stronger, groups take sides, diplomats become unable to resolve differences, and enemies arise within or outside the nation. Military force may then be invoked to protect the country, resulting in armed conflict and unpredictable outcomes. 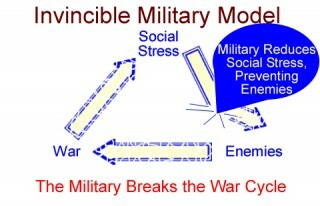 But even if conflict temporarily solves the problem for the victor, the social stress remains, fueling future cycles of conflict. In contrast, the absence of collective stress translates into the absence of tension between competing sides, thereby reducing the probability of hostilities. Today, the military of Ethiopia has an opportunity to overcome the cycle of war by deploying a scientifically verified technology of defense that neutralizes social stress. This new technology is based on the unified field of all the laws of nature - the most fundamental and powerful level of nature's functioning. The technology accesses and enlivens this unified field through subjective technologies of consciousness, thereby creating a profound influence of coherence and harmony throughout society. This results in measurable reductions of crime, terrorism, and war. The late Maharishi Mahesh Yogi revived systematic subjective technologies for experiencing the unified field, including the Transcendental Meditation program and its advanced techniques. When used in a military context these meditation practices are known as Invincible Defence Technology (IDT). They have been successfully applied by members of many faiths to eliminate conflict. If the military of Ethiopia were to apply these non-lethal and non-destructive technologies, it could reduce collective societal stress and resulting conflict. 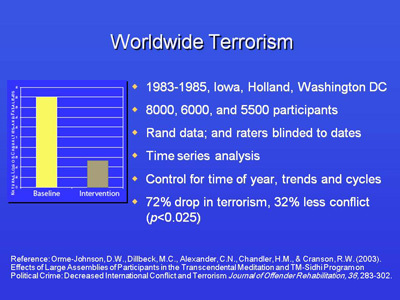 A global-scale study published in the Journal of Offender Rehabilitation documented a 72% drop in international terrorism. The Ethiopian military is responsible for defending its citizens. It can now succeed in its mission simply by creating a Prevention Wing - a group of IDT experts. The size of the Prevention Wing would be small - approximately the square root of 1% of the population of the country. Ethiopia would only need approximately 924 soldiers in its Prevention Wing. As part of its responsibility to protect the nation, the military is obligated to thoroughly examine scientifically proven methods for preventing war and terrorism. With the IDT approach, all that is necessary is to provide the proper training for groups of military personnel - or indeed, any sizable group within the nation. The military of Ethiopia has the opportunity today through IDT to create national security, invincibility, and peace. But the time to act is now. Major General (Ret.) Kulwant Singh, U.Y.S.M., Ph.D., leads an international group of generals and defense experts that advocates Invincible Defense Technology. He was awarded the Uttam Yudh Sewa Medal, the second highest decoration for senior officers during operations in Sri Lanka as part of I.P.K.F. (Indian Peace Keeping Force). David Leffler, Ph.D., a U.S. Air Force veteran, is Executive Director of the Center for Advanced Military Science (CAMS). http://www.StrongMilitary.org Dr. Leffler served as an Associate of the Proteus Management Group at the Center for Strategic Leadership, U.S. Army War College. A leading scientific journal in Pakistan, The Journal of Management & Social Science, recently published a paper by Dr. Leffler titled "A New Role for the Military: Preventing Enemies from Arising - Reviving an Ancient Approach to Peace," indicating that the military application of the Transcendental Meditation technique has merit.